It was once a perched water-table pond and spring. It was originally known as Kumulae Spring (Pond – also Kapaʻakea and later Hausten Spring/Pond) and was reportedly the property of Kamāmalu (sister of Kamehameha IV and V.) She and her brothers loved swimming in the pond; they and others shared food and drinks there. Groundwater flow cut through the limestone forming a karstic drainage system (Karst being a geological formation shaped by the dissolution of a layer or layers of soluble bedrock, such as limestone.) This region, in and around the lower portions of the University of Hawaiʻi, became part of the Mōʻiliʻili Karst. Caverns and perched water-table springs and ponds were exposed at the surface. The best-known of theses ponds was Kumulae. By the early-1920s, Mr. Hausten purchased and cleared the land, and stocked the pond with koi which interbred with existing fish. The large clear fishpond quickly became a noted attraction. It was the family’s garden home with beautiful tropical gardens of flora and fauna. Emma McGuire “Ma” Hausten was an avid gardener and planted white ginger, water lilies, plumeria from the South Seas, willow trees, kukui trees, breadfruit and fruit trees as well as Hawaiian herbs and medical plants. Then, ‘tragedy’ happened. In the autumn of 1934, the Hausten pond disappeared without warning, draining in less than 24 hours. It turns out, construction activities downslope from the King-University intersection struck a master conduit in the underground watered cave system. Water drained out. Upslope, the results of this dewatering were dramatic. The master conduit was eventually resealed, the cave’s water table temporarily recharged, but the karst was never the same again. There have been several instances of collapses since the dewatering. One instance in 1952 involves the Standard Trading store falling through the ground into the karst below it. Another instance involves the emergence of a large cavern downslope from the King-University intersection. But after the dewatering, the historic pond was never the same, the continuing drop in the water table especially impacted the Willows Restaurant. The willow trees wilted and the restaurant lost its attractiveness and its customers. The spring dried up and a remnant of the pond had to be lined with concrete. A manmade water feature surrounded by rock and plants has been built to recreate the ambience of the old days. In 1998, the site was sold and restored. The Willows re-opened its doors on the threshold of a new millennium in 1999, after six years of being closed. 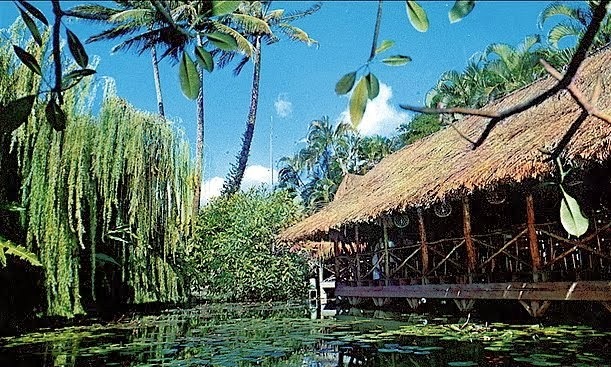 The image shows the Willows Restaurant and pond. In addition, I have added other related images in a folder of like name in the Photos section on my Facebook and Google+ pages.